Open Class: Brass: Spartans (16.1), July 5, Lynn, MA Percussion: Blue Devils B (15.5), July 7, Pleasant Hill, CA Color Guard: Vanguard Cadets (14.8), July 7, Pleasant Hill, CA View all scores and recaps. Storylines to watch • The Cadets and Santa Clara Vanguard are the third and fourth corps behind Carolina Crown and Blue Devils to break the 80-point mark in total score this season. 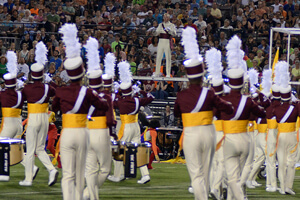 The Cadets (82.20) did so on July 3 in Bristol, RI. Santa Clara Vanguard (80.35) did so on July 6 in Denver. The Cadets reached the 80-point milestone on the exact same day 2013 compared to 2012, with Vanguard passing 80 points four days earlier this year compared to last. These were the same four corps to be the first to break 80 points in 2012. 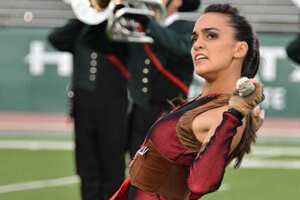 • Carolina Crown holds a 5-2 lead in head-to-head competitions with the Blue Devils notching four straight victories over the defending World Champions between June 29 and July 6. While Crown held a one-point lead over the Blue Devils on July 3 in Ogden, Utah, the Blue Devils slashed that lead in half, finishing a half point behind Crown on July 6 in Denver. The two corps will next face off Monday, July 8 in Omaha, Neb. • With several more wins over the last week, the Cadets' undefeated streak is up to 12. 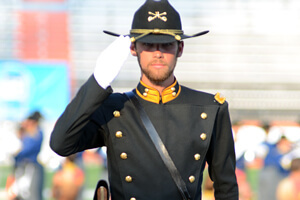 While the Cadets' score came in more than a point under Carolina Crown and just under a point under the Blue Devils' score on the same day at different events on July 6, the three top-scoring corps will compete head-to-head for the very first time this season on July 11 in Warrensburg, Mo. 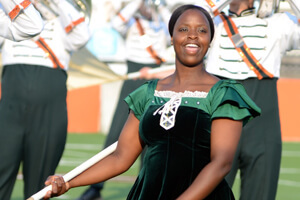 • The Madison Scouts, who have bested the Cavaliers this summer by as many as 2.7 points, continue to hold a lead over their fellow Midwestern rivals. On July 6 in Michigan City, Ind., however, the Cavaliers were able to narrow that lead to a small 0.45 gap. 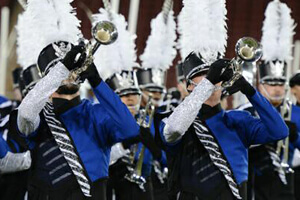 The two corps will next face each other head-to-head at the DCI Minnesota event in Minneapolis on Saturday, July 13. • Bluecoats and Phantom Regiment continue to be in a tight race with each other. The Bluecoats were able to get ahead of the Regiment on July 3 (the first time since their first event of the season on June 22), by a slim margin of a tenth of a point. After that July 3 event, Phantom Regiment went on to win the next three matchups, though the margin of victory has only been by an average of a half a point. • Santa Clara Vanguard's percussion section continues to score well, taking first in the Percussion caption in every one of its competitions this season. On July 6 in Denver, Vanguard's percussion outscored the Blue Devils by half a point and Carolina Crown by a full point. • Also in Denver on July 6, the Blue Devils bested Carolina Crown in the Brass caption 17.2 to 17.0, marking the first time they've done so since the very first meeting of these two corps on June 21 in Clovis, Calif. • On June 28, Jersey Surf started the season recording its lowest first score ever since joining the ranks of DCI's World Class in 2009, with a 52.40 in Jackson, N.J. The corps jumped nearly 5.5 points between performances on June 30 and July 3, and nearly 13 points total in just eight days, finishing with a 65.35 on July 6 in Chester, Pa. • The Blue Stars were a point and a half ahead of the Crossmen early last week, but the Crossmen were able to narrow that gap to finish just 0.05 behind on July 6 and again on July 7. The two corps will next square off on July 12 in the Blue Stars' hometown of La Crosse, Wis. The Troopers have held tight to those two corps in previous weeks and will also perform as part of the La Crosse lineup on Friday. 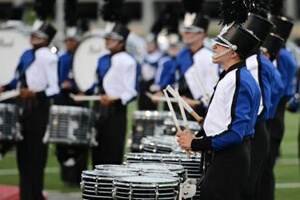 • The gap between Blue Devils B and Vanguard Cadets was the widest its been all season on July 6 and July 7 in Sacramento and Pleasant Hill respectively, however that difference was still less than a point (0.9). The two Open Class California rivals will face each other again on July 13 in Laguna Hills, Calif. • The Columbians wrapped up their inaugural tour on July 2 in Boise, Idaho, Thunder wrapped up its 2013 tour on July 6 in Denver, and Music City will make its 2013 debut in Open Class competition on July 12 in La Crosse, Wis.